ive years ago, CES Cru was tag-teaming bad guys. The cover of the hip-hop group’s debut album, Capture Enemy Soldiers, showed Ubiquitous (Mike Viglione) and Godemis (Donnie King) basking atop a mound of corpses. On the cover of the duo’s full-length follow-up album, The Playground, which launched Friday, the two MCs are engaged against each other in a laser-blaster hell storm in outer space. If such a scenario seems silly, it’s meant to be. oth Viglione and King refer to their birth identities as their “government names,” an allusion to the firebrand philosophy of Malcolm X. Whereas King selected “Godemis” for its powerful intonation (and because “it’s a hell of a lot better than Tex, short for Technix,” he says of his former alias), Viglione chose “Ubiquitous” because it reflects his utmost desire: to be everywhere at once. The name could also speak to the omnipresence of violence; Ubiquitous believes that violent thoughts and deeds stain the American conscience far more now than they did just half a decade ago. Playground is that testament. In the lyrics to Playground’s introductory track, “Teeter,” the youth of America are like the lost but never found — a sparkle dimmed by a world more apt to teach through fists than friendliness. Kids these days don’t care for things/They don’t teeter-totter, share the swing, Ubiquitous raps. Later in the album, the television is dubbed the “Idiot Box.” Injected into the song’s prelude is audio from a news broadcast about a woman whose wig stopped a speeding bullet. The strange tale is juxtaposed with a cameo by the late Billy Mays, whose wishy-washy utterances are the perfect spit shine. The album finishes with track 19, “Totter,” which plays like a wailing ambulance forever racing to find help. Playground seems to conclude that it’s unlikely that Generation Y-ers will ever learn to teeter-totter; they’d much rather tussle on the jungle gym. 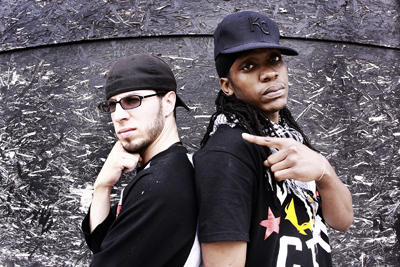 Soldiers had nearly a dozen collaborators and multiple producers, but CES Cru kept contributions to a minimum on Playground, tapping such artists as Stik Figa, Brother of Moses, Smoov Confusion and Kutty Slitz (formerly known as General Ali). Leonard DStroy of the Deep Thinkers acted as sole producer. In 2007, CES Cru released the 12-inch single The Block/Spellbound, and in 2008, it released the mixtape Code Name: Iron Giant. biquitous and Godemis met in the summer of 2000 by way of a mutual friend, Clarence Draper, who MCs as Vertigone. Godemis had established himself as an up-and-comer in the realm of hip-hop, having rapped professionally since attending Paseo High School. He enjoyed a stint in a hip-hop group with Joe Good that signed with No Coast Records in Lawrence before disbanding. Soon afterward, Godi became a part of CES Cru, which had been founded several years earlier by Perseph One and General Ali, who coined the group’s acronym: Conglomerate Elements of Self-Consciousness. The fluid roster would also include Sorceress and Mad Dog 20/20. Ubi had moved to Kansas City from Arvada, Colorado, following his friend Daniel Bartle (who, under the alias Lucid, designed the album art for both of CES Cru’s full-length albums). Ubiquitous got into rhyming shortly after graduating high school. His college education was sporadic and short-lived; he says when he did go to class, he spent more time crafting lyrics than listening to lectures. “College was really just an expensive way to write rhymes,” he says. hanks to an unwavering endorsement by Godemis, Ubiquitous was admitted into CES Cru in late 2000. Unfortunately, a mass exodus to Texas enacted by CES’ founding members coincided with his arrival, and much of what had been CES Cru was no more. For a while, Ubiquitous says, CES Cru remained intact through occasional meet-ups and by mailing songs and beats. But eventually, CES Cru was left in the hands of Godemis and Ubiquitous and Sorceress, who had a role in roughly half of Soldiers. Her leaving was not easy. Nor was a 2007 burglary in which Ubiquitous’ home was ransacked of all valuables, including his Wii, his computers and his recording equipment. It’s why CES is an acronym with infinite possibilities. For now, it’s Children Everywhere Smiling. But that could change.